Ohuhu® Camping Stove/ Backpacking Stove is perfect for camping, hunting, backpacking, picnic and other outdoor cooking activities. *Stainless Steel material creates one of the lightest and most portable camping stoves on the market. The included carrying case further adds to the portability as it can simply be tossed in a bag without worry. 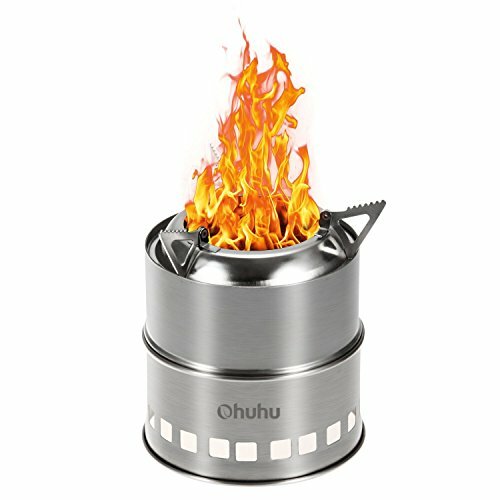 *This Ohuhu® Camping Stove can use either firewood or solid alcohol to cooking. *Pot Stability - 3 arms pot support system creates a stable cooking platform and distributes heat evenly. *Environmentally Friendly: No fuel canisters, no chemical emissions. If you have any questions about this product by Ohuhu, contact us by completing and submitting the form below. If you are looking for a specif part number, please include it with your message.